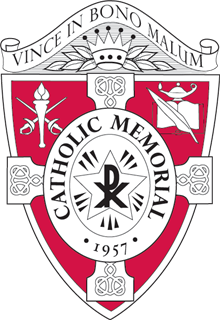 West Roxbury, Mass.— Sean Kyne, the former Government Chief Whip of Ireland, and Fionnula Quinlan, the current Consul General of Ireland, visited Catholic Memorial School to meet with members of the CM Irish Studies program on Monday morning. The CM Irish Studies Program, the only high school program outside of the European Union to offer an Irish language elective, hosted a noontime reception for their political guests. Mr. Kyne and Ms. Quinlan, accompanied by Vice-Consul General of Ireland Aoife Budd and Gaeltecht Authority of Ireland Representative Ronan Mac Iomaire, met with school principal Tom Beatty and toured the school’s campus before attending the noontime reception. 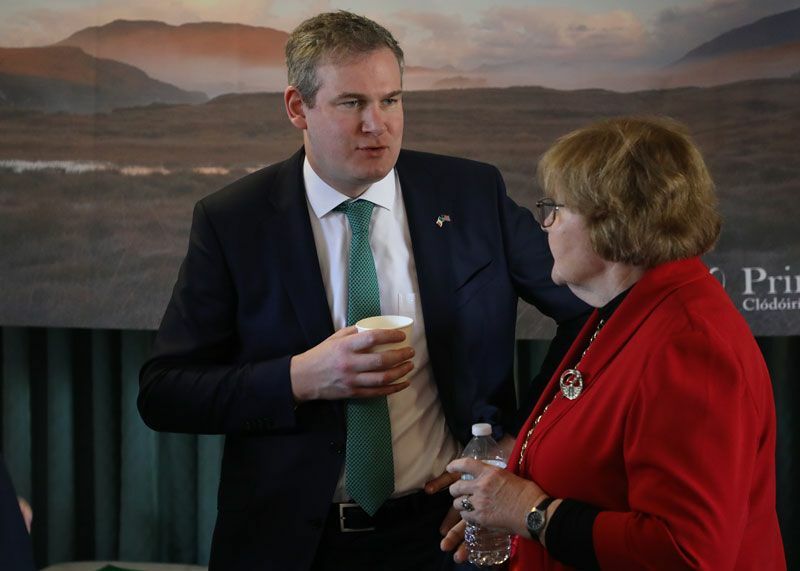 “There are less immigrants coming from Ireland now than a few generations ago,” said Minister Kyne, who marveled at the Irish Studies program’s initiative to preserve the Irish Language and Heritage in the Greater Boston community. At the reception, students from CM's Irish I and Irish II courses presented their projects on Irish heritage to their guests. The projects, made during CM’s International Week celebration just the week prior, lent insight into the students’ interest of Irish culture. Topics ranged from Irish genealogy to the fundamental rules of Gaelic hurling. One student, Brian Melvin, presented a project on his grandfather, Oliver Melvin. His grandfather rowed for the Galway Rowing Club and won the historic 1948 Maiden Eight rowing championship. Ms. Mary Concannon, Head of the Irish Studies program at CM, coordinated the event and took pride in all the projects on display. “When I see kids interested in the Irish language, they tend to step forth and show themselves in a different light in the classroom,” explained Ms. Concannon. Ms. Concannon recalled students who brought in old postcards and family relics from Ireland after the first few days of her Irish Studies courses. Found in family basements and attics, the postcards and relics remind the students of a profound connection to their heritage. Every year, she attempts to strengthen this connection through the summer Irish Immersion Trip. In the process of growing her program, Ms. Concannon developed a strong relationship with the Irish Consulate of Boston. When the Irish government appointed Mr. Kyne as their representative for the City of Boston’s St. Patrick’s Day festivities, the Consulate reached out to Ms. Concannon. The Consulate informed her that Mr. Kyne intended to add a high school visit to his travel itinerary. CM appeared an obvious destination for its prestigious Irish Studies program. Prior to their CM visit, the political cohort met with Boston Mayor Marty Walsh and Massachusetts Governor Charlie Baker. They also gave keynote addresses at the Irish Cultural Center in Canton, the Irish International Center in downtown Boston, and Boston College in Newton. When Mr. Kyne and Ms. Quinlan visited CM, they made sure to exchange parting gifts with both Mr. Beatty and Ms. Concannon. The gifts proved a nice token of gratitude toward the trans-Atlantic relationship between CM and Ireland.